The systems, strategies and tactics in tennis are best described as organized chaos. During a match, no competitor – even those with great on-court intuition – knows exactly what will happen in the next second. Multi-directional sports are a read-and-react game where success hinges on individual tactics, conditioning and game play experience. A well-rounded tennis player needs a toolbox of movement capability that includes an ability to command the body to move creatively, which represents elements of balance, mobility and reactivity. An athlete’s perfect position to apply optimal power is their perfect position of balance. Any athlete that requires strength and agility on his/her feet can improve game strength through balance-resistance training. The goal is to train weak links in the body, helping make sure each joint is stable, and enabling the individual to develop explosive strength in a standing position. It is critical to acknowledge that the brain thinks in terms of movement, not muscles. Coaching “toe-to-fingertip strength” improves muscle sequencing and the summation of power as muscles contract across the ankle-knee-hip-core, continuing up the kinetic chain, and resulting in optimal power/skill application via the tennis racket. Balance is critical to tennis where athletes are loading or biasing one leg the majority of time, especially when changing direction or hitting the ball. When an athlete is well-trained in the skills of balance and deceleration, both contribute to first step quickness and weight shifts by providing perfect transitional mechanics between 1) stop-and-start and 2) set-up-and-strike sequences. As a result, quick, agile, stronger, safer and more powerful striking mechanics are produced…ALL of which are key attributes that differentiate top and lower level players. 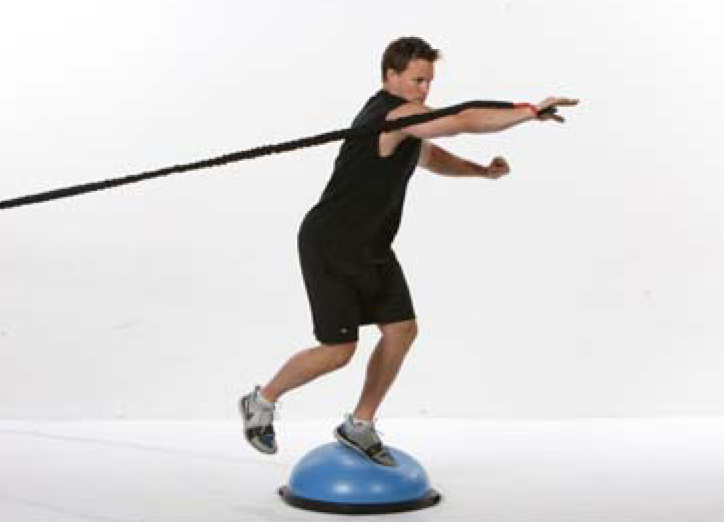 Unstable training also develops ankle and knee responsiveness. Stronger, reactive ankles make a tremendous contribution to stabilizing the foot/ankle complex and improving movement related skills. Strong knees help to counter the effect of ever-present and damaging shear forces multi-directional athletes must endure. Furthermore, improving knee joint integrity by training in unstable environments helps prevent common sport MCL and ACL injuries. Why Must Balance Integrate with Muscular Strength and Endurance? Purposefully shift COM outside the BOS to gain a tactical advantage over an opponent; or to achieve an advanced technical skill. Teach the body to automatically, successfully and quickly recover from unintended deviations to COM. Acquiring these skills harness positive adaptations that are gained by structuring training to overload the physiological systems that control balance. 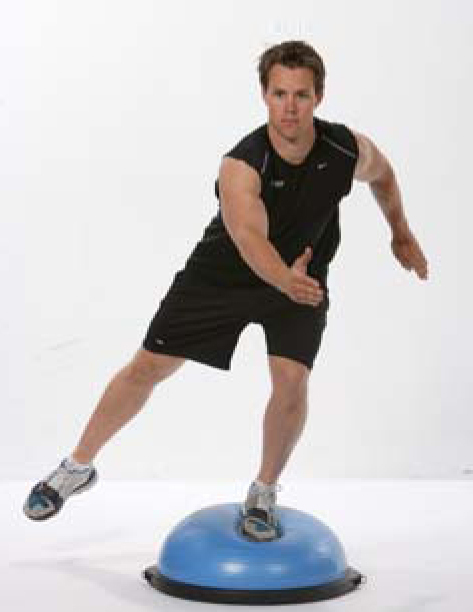 Balance exercises should be created with purpose and designed to manipulate specific mechanical, sensory and motor control factors that modify the body’s requirement for muscular contraction and coordination. How the coach progresses should be centered on a concept coined “neural complexity.” Designing structured balance exercise based on selection of a level-appropriate continuum can be systematically manipulated to define specific challenges. These include increasing muscle activation, improving reactive correction responses, increasing strength and decreasing the risk of injury. Exercise must be structured so coaches can match the drill demands with each athlete’s capabilities, readiness and experience. Overall, fitness and strength are only useful when they are developed with an exercise training style that improves the physical requirements (specificity) tennis match play draws upon. Integrating strength, movement and balance helps athletes build strength and power in a manner that will transfer directly into a winning performance. This entry was posted in BOSU, Functional Training, Personal Training, Sports-Specific and tagged balance training, BOSU, douglas brooks, exercise, fitness, peter twist, tennis by HQH Fitness. Bookmark the permalink.